Seagull Scientific BarTender label design software provides welcomed flexibility by offering a wide range of features that support most every environmentincluding those concerned about safety. BarTender works with both laser and industrial barcode printers, which sets them apart from their competitors. In addition, this software solution enables RFID encoding for labels, tags, and smart cards, and it provides comprehensive support for nearly every barcode symbology. We use bartender for all of our label printing needs. We use drop files to trigger. Pros: The user interface is really well defined for people that don't code. Designing label templates is as easy as power point. Setting up the fields that need to read the data is easy to set up to. There is a very short learning curve with the product. Cons: We have it set up to run waiting for drop files (with the integration builder). Because we aren't using the front end for normal use, end users can't get error messages. If would be nice if it had a better monitoring system to know when something goes wrong. It's not that often that it does, but when it does it can cause some problems for our business. Overall: They play really well with the zebra printers, which a lot of other software doesn't (like SSRS reports). Also the integration builder is a really powerful way to automate a lot of things. It's a life saver. And the ease of creating labels is really nice. Don't forget you can print to a regular printer too. You can make some very good paper reports that are much easier to maintain than SSRS reports. Pros: The diverse functionality of creating and printing labels. Creating labels is fast and easy. Integrations is a great tool and are very powerful when wanting an action repeated easily. Librarian is a great feature to ensure label revs are tracked and managed properly. Cons: The cost is based per printer. We have multiple printers for the sake of not having to travel to retrieve your label, however, for the price tag it's not worth activating a printer that only gets used once a week. The integrations is very finicky and occasionally needs to be restarted for no reason at all. The printer default settings do not save and revert back to original so I manually have to change the print speed and darkness on each label. Overall: Fast and easy creation of labels. Ability to track rev changes on labels. 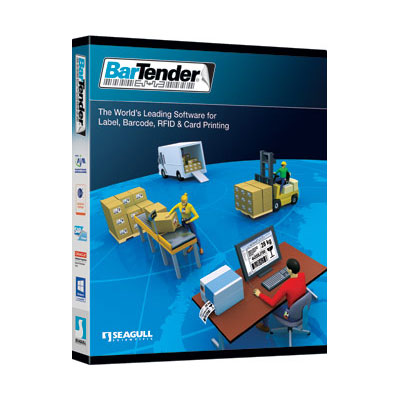 Overall: BarTender 2016 by Seagull Scientific is really a great label or barcode software for any business no matter the size! It is sophisticated and professional yet very easy to use, especially for someone like me who was trying to get their small business off the ground. The software itself is a little pricey for small businesses, but you are definitely paying for the quality of the product. The process of creating labels and barcodes is very smooth and easy to customize. You can add symbols, images, text, and even your logo which was fantastic. They also make it really easy to download and update your printer drivers which tends to be a pain with other products. Pros: I didn't pay for the software or the license. The software download is free, and has a 30 day free trial. Cons: Very disappointed in the new 2016 version. Was this product actually run by QA before release? I suspect there was nothing but plug and play sceanrios tested. Very little insight into customer service. Have a lot of difficulty getting answers from the tech team. This is what happens when a company cuts back on 'costs' by elimiating quality assurance and customer support. SOme of the new 'features' have absolutely destroyed Database/setup connections. After upgrading from 10.4, all tables from our XML payloads now crash bartender when you try to do ANYTHING with them (Great coding guys). As a result, the text file source has become quite useless unless you are using a csv. I apologize for the issues you're experiencing. They are as unacceptable to all of us as here they are to you. We've brought this to the attention of BarTender's VP of Technical Services, and he's reviewing your support tickets to see how we can help. I'd also like to offer reassurance that we haven't had any reductions to our QA or technical support teams. We recognize how important these functions are, and are, in fact, investing in their growth. I understand Capterra is providing my contact information to you. Please don't hesitate to get in touch with me. I'd like to know how this turns out. Easy-to-learn and offers diverse options for barcoding including serialization. Pros: It's so easy to get around the user interface, even for people who have no experience working with code. There's not much of a learning curve to this application. Anyone can create labels with great ease and diversity. The integration builder provides an avenue for automation and makes it easy to select an action we want duplicated. The program also works very well with zebra printers. It also has a the serialization feature which is pretty cool. Cons: The only downside I can think of is that they don't have a live chat feature on their website, which would really help if you're already on there and looking for specific information. Cons: Still trying to figure out how to use a label with multiple printers and not have to save the label twice, but otherwise great software. Overall: One solution for all site printers and standardization of labels across the company. Pros: Very easy to use, simple drag and drop and very easy to modify text boxes, etc. Love how they offer the free trial to test before buying. Also, it is compatible with just about every printer on the planet! Cons: Although it still works without, it has to link up to the internet for licence checking. This can slow down the opening of the application. Good news! We have simple solutions to your issues. - In the new window, choose "Text format"
Text will now remain a consistent size. BarTender offers pre-formatted new FDA nutrition labels for both the one- and two-column format, and the present FDA nutrition label is included in the BarTender documents folder of your software. These templates include business rules to meet FDA's font size and spacing requirements, and you'll be able to use the labels' variable data fields to autopopulate the nutrition info directly from your database. I'd like to send the new label file to you. Contact me via the email address Capterra provides. You should never have to insert all those lines by yourself!! Pros: Bartender makes my life easy making customer labels. I use Bartender to make scan labels and it seems to be the easiest to use. I've used 2 others and they become more of a challenge. They seem to have it figured out. It's easy to select and print. Cons: There's a lot to know, to make it work. I've learned to use the instructions with Bartender. I wish it was easier to make changes without having to go to my original file to fix issues or add items. Pros: I really like the Online Activation and network label printer license server, this helps tremendously managing the Active users / printers on the network. Cons: Older versions had issues with activating the license keys, but this has been eliminated on Newer versions. The most recent versions of the software have proven to be very stable. BarTender makes business more comfortable. Pros: I have been using BarTender since 2017.It is really good and easy to use. I really like to work with it. Creating labels is easy and fast and I had design more than 1k labels. Setting up the fields that I need to delivered the data is easy to settings up. BitTender web site helps a lot to get the information such as video tutorials and other guides. First time I got the trial version. It is really good 30 days trail version. If I purchase for first time, I don't know software is good or bad. Trail version save the money. Cons: First time I started with BarTender version 9.0, I guess which is oldest version. I was good for me until I start to work on version 10.1. That is much better update. When I want to figure out some problems there is no online QA or technical support team. There are no more cons I found. Overall: Good solution for our business. This is very Fast and easier for train person in barTender. I have got high-quality custom labels. Great to use for items to meet requirements from our vendors. Pros: The ease of use to make labels and meet the requirements for different vendors we work with. Also, creating labels for items with lost or missing labels. Cons: Not able to add all minor details needed for some vendors, not requirement. Overall: Allows us to create labels when ever needed for our items and create custom labels for special vendors. Pros: This software is so easy to set up and configure with external data sources, I was really amazed by this. The latest implementation of Bartender was a central printing solution for label printers. The data for the labels originated from a Filemaker database and a Dynamics solution. For this purpose we've used some of Bartenders automation features. Cons: The only con I've experienced so far for Bartender Professional is the lack of (written) documentation (or I just couldn't find it online besides some videos on the support sub domain). On the other hand, I didn't really need the documentation as it was so easy to configure. Pros: It is very effective in doing what it promises and it looks really like a native application. It is not intrusive as well with its icon. Cons: Sometimes it lacks slightly but it doesn't affect its usage. Pros: Easy to use template. No need for too much tech support . Cons: Licensing limitations, wish we could use the same for at least 2 computers. Pros: Love that we can print even the smallest of labels for our smaller items. Print quality is superb and can be used with many different printers. Cons: Limited computer licenses and there was a bit of a learning curve when we first started using it, but customer service was great and I leave most of the design stuff up to the tech guys. Cons: Still didnt face one looks simple clean and does what expected from it. Cons: Sometimes it will be very time consuming to drag for the layout(alignment) I still remember how painful and stressful when we tried to come up something that has very strick requirements. Cons: I didn't like that there are so many different variations of the software with so many different things that those versions could or couldn't do. Overall: it ended up doing what I needed without having to research too deeply. Pros: I like that it is intuitive and easy to use. I like that changes can be easily made to the program. Cons: There isn't really anything that I don't like about the software, but it would be nice if there was a way to incorporate special characters into the labels. Used for all our product and misc inhouse labeling. Pros: One of the major pluses is that you can design labels off line away from production. Multiple labeling share labeling formats from a server. Cons: It is more expensive than some of the other cheapo labeling software but is worth the money if you are using constantly. Pros: Barcode output options are very diverse. Cons: Really not helpful for first-time users. Overall: I was asked to use this software to create various barcodes for a new product range my organisation was releasing. As a first-time user, I did find the software to be very difficult to navigate. After some trial and error though, it became obvious to me that the software was very diverse. For someone who knows what they're doing, the barcoding options are very diverse. Overall: to design an urgent barcode for a label of a new product requested by a client of us on the company ..
Pros: We use BarTender for customer labels and it does a great job. Cons: It takes time to learn how to set it up and use it. Very easy to use which is great for someone like me who has little patience. Pros: I am a Safety Lead and I am in charge of labeling all in house chemicals. This program helped greatly in that it had everything I needed. Cons: sometimes it prints outside the label. Takes a bit of fidangling but once you figure it out your good to go. Overall: Benefits were being able to make my own label on how I wanted it to look and not having to order from someone else and settling for their design. Comments: The way the system works, easy to understand and the fact that they charge licenses only for the number of printers, not the number of computers you have the software installed on make the system worth way more than you pay for it. Fast and efficient software, makes my business life very easy. Comments: Fast and efficient software, makes my business life very easy. I would recommend this software to anyone who needs to utilize this type of service. Pros: I really like that I can easily print labels for packaging, and integration with SAP. Cons: I haven't really used other bar code software so I don't think I have any complaints.